This is my 7th picture book. 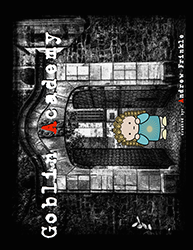 This 8x10 picture book is a guided tour to the place where little monsters are made: The Goblin Academy. Get a firsthand view of all that happens there, the classes, the hall monitors, lunch, and more! ​Make your own monster masterpieces at the end with 8 DIY pages.